This is the third book in the Nine Kingdoms series. Read our review of the first book, Star of the Morning, and the second, The Mage's Daughter. The fate of the kingdom of Neroche is intertwined with the closing of Gair's well. Miach, the archmage of Neroche, is determined to help Morgan find what she needs, not only because the safety of the Nine Kingdoms hangs in the balance but also because he will do anything to protect her. Together they must search out the mysteries of Ceangail, and the dangers of Morgan's own bloodline. 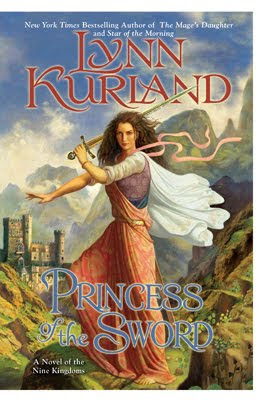 My Review: Princess of the Sword, despite it’s lame-o name, was much better than The Mage’s Daughter. For one, Morgan wept less, fought harder, and we witnessed the return of her spine which seemed to all but disappear in the previous book. I appreciated some of the surprises strewn throughout the book and can honestly say that I didn’t see all of them coming. I enjoyed the unexpected moments and little quirks thrown in, but had a hard time not drifting off when the author waxed entirely to poetic about Morgan’s beauty or when characters started to over think things (and I had to read about it). Believe it or not, the romance aspect of this book was my least favorite part. Because Morgan and Miach managed to fall desperately and irrevocably in love in the first two books, their relationship in this book was all sweet spoken words with very little tension or conflict between the two of them. What fun is that? 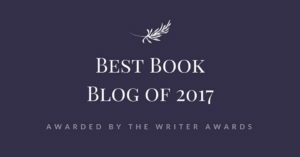 While I applaud Kurland for her attempts at “keeping it clean”, after the first book (and part of the second) she had no idea where to take the characters when she couldn’t take them into the bedroom. Instead she settled for beating me over the head with their all-consuming love for one another. It gave me a headache (not really). Very few books are made for everyone. I do not like mysteries – unless they somehow involve food. Depressing memoirs just make me want to cry – but I love Elizabeth Berg. I think that fans of fantasy romance, and more particularly, those in search of a clean fantasy romance will probably enjoy this series. Sum it up: Liked it, but didn't love it.